With Windows Server 2008 R2 released to the market, VDI has come into the picture as the future of next evolution of desktop. Now you can use your Netbook or any computer with a browser to initiate your VDI session. 1. Using a browser on your computer, key in your VDI URL. For example: https://rdsacess.ms4u.info/rdweb (https://domainname/rdweb). Below page appeared. Quite similar as Exchange Outlook Web Access (OWA). Enter a valid username and password. 2. Once you have authenticated, you will redirect to a page where you can see a pool of virtual machine which i have assigned. There are 2 different ways desktop sessions are display out. You can have a “personal desktop” or a “virtual pool”. The personal desktop (Display as My Desktop icon) means every time you get a VDI guest session it is the exact same dedicated session just for you. The virtual pool is a series of sessions that are available that remote users “share”, so the base guest session is shared, but through a seamless use of “roaming profiles” type of configuration, the user experience is unique to that guest session so that even if they go back into the virtual pool and get a different guest session, their files, profile configuration, etc come with them and they see the same experience pooled system to pooled system. Click on Win7 Client Pool to start activate/access to Windows 7 Client Virtual machine. 3. 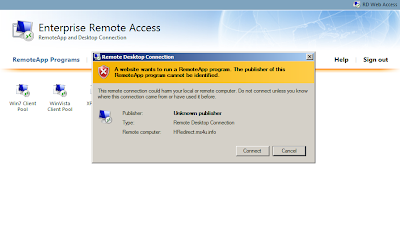 Remote desktop connection dialog prompt. Click Connect button. 4. A dialog box appear to request for valid authentication. 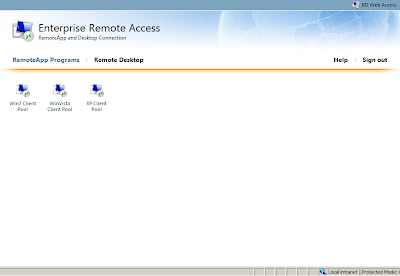 Once you have key in a valid username and password, it will RDP to Windows 7 Virtual machine. As i can see, VDI is a cool stuff and very useful for mobile worker. Let look into planning part. For VDI deployment, you need to properly do planning especially on resources that you want to assign to each VM. You can easily setup 30 VM and reserved 2GB for parent partition. (Just estimation, you still need to consider about processor utilization). b) Virtual Machine in virtual desktop pool must be identical and has program installed. c) Virtual desktop can only consist Windows client operating system. No server operating system. d) A Virtual machine can only be a member of a single pool. f) The name of the virtual machine (display on Hyper V) must be FQDN and must be the same as virtual machine computer name. g) User should not save any file on a virtual machine that is in virtual desktop pool. The reason is user may not be connected to the same virtual machine next time. b) Display as "My desktop" Icon. c) You can remove the assigning VM by using Active Directory User and Computer. d) Schema must extend to Windows Server 2008. Domain functional level must be at least Windows Server 2000 native mode. Components (a) until (e) should install with Windows Server 2008 R2. 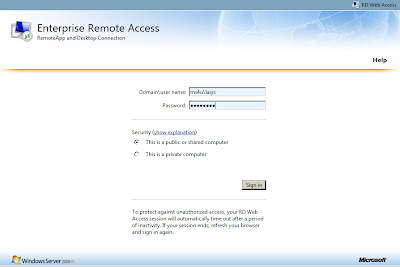 1.A user initiates the connection to the virtual desktop pool by using RD Web Access or by using RemoteApp and Desktop Connection. 2.The request is sent to the RD Session Host server running in redirection mode. 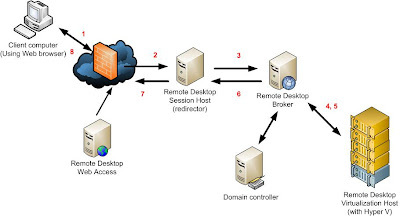 3.The RD Session Host server running in redirection mode redirects the request to the RD Connection Broker server. 4.The RD Connection Broker server checks to see if an existing session exists for the requesting user account. If a session already exists, proceed to step 6. If the session does not exist, proceed to step 5. 5.The RD Connection Broker server sends a request to the RD Virtualization Host server to locate and start the virtual machine. 6.The RD Connection Broker server returns the virtual machine name to the RD Session Host server running in redirection mode. 7.The RD Session Host server running in redirection mode redirects the request to the client computer that initiated the connection. 8.The client computer connects to the virtual desktop pool. APP-V seems as another components that work in VDI. Will look into it soon..
Great overview of the Microsoft Hyper-v VDI environment! Any recommendations on thin-clients to utilize pooled Win 7 desktops? You can use any thin client. Not restriction. i have tested on Igel Thin client and HP Thin Client. Work like a charm. Dou you have any documentation about how to configure the Thin Client to work with the VDI infratructure? Configuration on thin client is depend on hardware vendor. But majoriti can support web browser. For Igel, you need to check out their documentation on how to "Gel" together..